Westfield is set to sell its Nottingham shopping centre in a £55m deal, it has been announced. The company which owns the rival Victoria Centre shopping complex in the city is set to take over Westfield's interest in Broadmarsh. Capital Shopping Centres hopes to buy the 75% stake in the Broadmarsh centre. 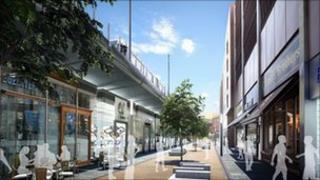 The deputy leader of Nottingham City Council said he hoped a planned expansion of the Broadmarsh shopping precinct would still go ahead. In March, Westfield submitted plans to Nottingham City Council for a £500m expansion of the centre. More than 6,000 jobs were expected to be created as part of the redevelopment. A spokeswoman for Capital Shopping Centres (CSC) said: "CSC has conditionally agreed to acquire Westfield Group's 75% interest in the Broadmarsh shopping centre in Nottingham. "Westfield and CSC are now in discussions with Westfield's partner, PossFund, about the proposed acquisition and PossFund's intentions with respect to its 25% interest in Broadmarsh." Michael Gutman from Westfield said: "Given Westfield's strategic focus on major iconic regeneration schemes we have taken the view to withdraw from Nottingham. "This will allow the city to make unfettered progress with its ambitions for regeneration, and Westfield to focus on new schemes and opportunities similar to those at Westfield London and more recently Westfield Stratford City." The city council, which owns the Broadmarsh lease, has been planning the redevelopment of the centre for almost two decades. Deputy leader Graham Chapman said: "The great thing about it is that we've got got two shopping centres and people move between the two. There is a great deal of potential down in Broadmarsh. "They've thrown £55m at it, they're not going to let that lie fallow and they've also got a couple of planning permissions so we've got to work on getting something out of this deal."